While many members of our connect2 community are entrepreneurs, many others are employed in the corporate world. If you have – or seek – a corporate, brilliance-based career in which you make a positive impact, today’s post is especially for you. 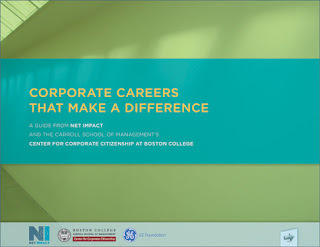 Net Impact and the Center for Corporate Citizenship at Boston College just released a new career resource called Corporate Careers That Make a Difference, an eighty-page guide to pursuing a career in corporate citizenship. Net Impact is a global organization of students and professionals using business to improve the world. They define “corporate citizenship” as an umbrella term that includes both social impact (encompassing corporate social responsibility (CSR) issues) and environmental impact (encompassing sustainability issues).